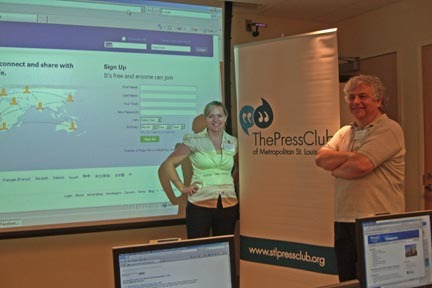 “How to Conquer Confusion and Use the New Media” was the subject of the July 18 Press Club hands-on computer workshop led by Elizabeth Erickson (left) and Richard Gavatin (right) at Webster University. The three hour presentation gave participants insights into how new media is an important tool in marketing one’s skills and expanding one’s network of contacts. For journalists and communicators, a working knowledge of the new social and professional media is essential to keeping a job, finding a job, or being your own boss. But new media is developing so rapidly that it’s difficult to catch up. Join Press Club members for a hands-on workshop that will replace your confusion with practical communications tools. In just three hours you can develop a website, create a blog, get on Facebook and LinkedIn, learn to build your brand, and—of course—Twitter; plus explore new web-based information sources. Two local experts, Richard Gavatin and Elizabeth Erickson, will guide you through the new media. Richard, a Press Club board member, is a consultant on websites and web design. His company, IMS, has specialized in customization of accounting software since 1984. Elizabeth is the principal/creative with Rangency, a new company that helps clients develop brands and networks. For the completely clueless, Richard and Elizabeth will offer the basics. For those who have experience with the new media, they will introduce new strategies for expanding networks of potential clients and news sources. Must make reservation. 636-230-1973. Click Here for Credit Card Payment. *Mild anxiety when confronted with new media, hand-held communications devices, and tweets.